Roman’s formula allows for so much lovely variety in each book of this series that it hardly seems like a formula at all. 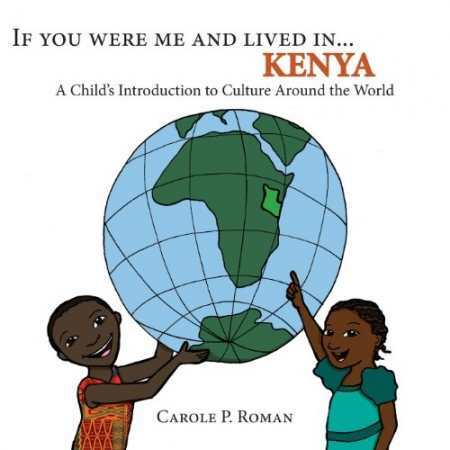 Carole P. Roman has created a marvelous premise for her series of educational children’s books: young readers are given the opportunity to realistically envision a foreign country without leaving their homes, libraries, or classrooms. Her latest volume, If You Were Me and Lived in …Kenya, is designed to attract young ones who have heard of Africa, perhaps know a bit about it, and have a zest to learn more. The book emphasizes words that give a flavor of the place. Common names are suggested: Jaramogi or Kiano for boys, and for girls, Akeyo, Kioni, or Dalia. Mother and father are generally called mzazi and baba; the currency is the shilling; and a main meal might well include nyama choma (roasted meat), a Kenyan favorite. One possible adventure for travelers would be a visit to the Maasai Mara National Reserve, where wild animals can be viewed safely in a natural environment. A multicultural event, the Mombasa Carnival is a yearly highlight, offering “a lively display of the sights and sounds of Africa.” A charming scene shows a group of kids making galimoto—cars and airplanes—out of found materials such as wire, sticks, and cloth. These deceptively simple homemade toys would fascinate children from anywhere. Information that should perhaps have been included, even in such a brief overview, is the specific influence foreign cultures have had on Kenyan society. Foods noted, like chapati, samosa, and chai, came to Kenya via its significant Indian population, and the game of cricket, pictured in the book, was, of course, brought by the English. With her children’s picture book series, Roman, a former teacher, has developed a popular and award-winning formula that provides so much variety that it hardly seems like a formula at all.